SPECIAL YEAR END SALE ON TAPE MACHINES IN STOCK! CONTACT US FOR DETAILS. ET Tapers & Equipment manufactures the Rhino series line of case taping machines, which are proudly made here in the USA using the highest-quality materials available. Our commitment to unsurpassed satisfaction of our customers is our constant goal. 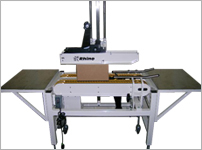 ET Tapers & Equipment manufactures case taping machines for all your packaging needs. Our line of case tapers includes the Bottom Belt and Side Belt models in semi-automatic and random. 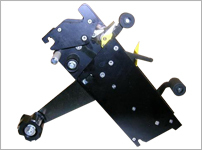 The machine frames are constructed of welded structural steel tubing for strength and durability. Shown is the semi-automatic Bottom Belt "Rhino RB2" with optional packing tables. Our Side Thread tape cartridges are available for a wide range of applications, including standard RSC, Low Profile, Side Taping, Strip, and Front L. Easy-loading top and bottom cartridges are interchangeable. Sturdy and reliable, our tape cartridges are built with you in mind.